Enamel: The most outer layer. Hardest substance of the body. Dentin: The layer under the enamel. Because dentin is softer than enamel, cavities enlarge faster. Pulp: The nerve of a tooth. Gum: Surface tissue that covers alveolar bone. 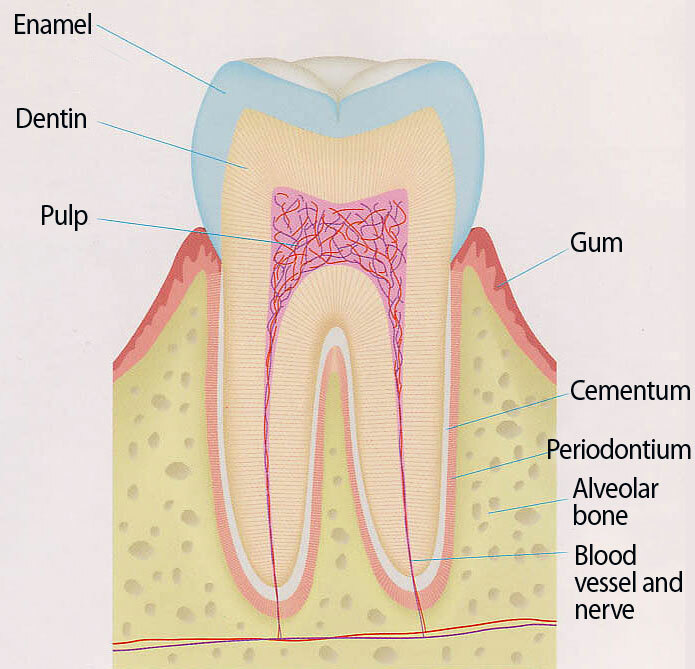 Cementum: The outer layer of the root of the tooth. Periodontal ligament: Tissue that joins the alveolar bone and cementum. Alveolar bone: Bone under the gums that anchors the roots of tooth. Blood vessel and nerve: Nerve tissue that connected to the pulp. Copyright(C)Dr.Amano Dental Clinic All Rights Reserved.